The tomato clownfish, Amphiprion frenatus, is a clownfish that is found in the waters of the Western Pacific, from the Ryukyu Islands, Japan, toMalaysia and Indonesia. 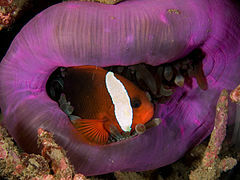 It is also known as the bridled clownfish, red clownfish, or tomato anemonefish. The adult fish is bright orange-red, with one white vertical stripe just behind the eyes, joined over the head. Some varieties have darker coloration or dark spots on their flanks. Juveniles are a darker red, with three vertical white bands and black pectoral fins. They can grow to 14 cm (5.5 in) in length, however the female is usually larger than the male. The eggs are deposited on a flat surface and tended by the pair until they hatch (6 to 11 days). They prefer to nestle in purple anemones such as the bubble-tip anemone, Entacmaea quadricolor, or theSebae anemone, Heteractis crispa. In the wild, the species eats zooplankton and algae, being an omnivorous species. Note: This clownfish has been tank raised in Milwaukee.